Below are photos of some 3 wheel scooters I've either owned or am familiar with. This is a very nice industrial quality scooter with long range capabilities and lots of cargo capacity. My City Shuttle and homemade trailer at the Daytona Turkey Rod Run 2003. I have enlarged the motor. There is a 24 volt gell cell battery pack on the trailer under the backpack for extended range. I smoked the motor controller on that trip. Pulling all that mess through the grass infield was just too much. The scooter was stolen on the return trip. The police recovered the chassis minus the body and wiring. I turned it into a hotrod. 48 volts worth of Hawkers and a 400 amp Curtis controller resulted in 54 mph on the radar gun. And the realization that I needed MUCH better brakes. Without a body to get in the way, I'm currently reconfiguring the scooter with an ETEK motor and two wheel drive. This should be scary. Even with much less motor it's a wheelie monster. It'll get a full web page when I'm finished. 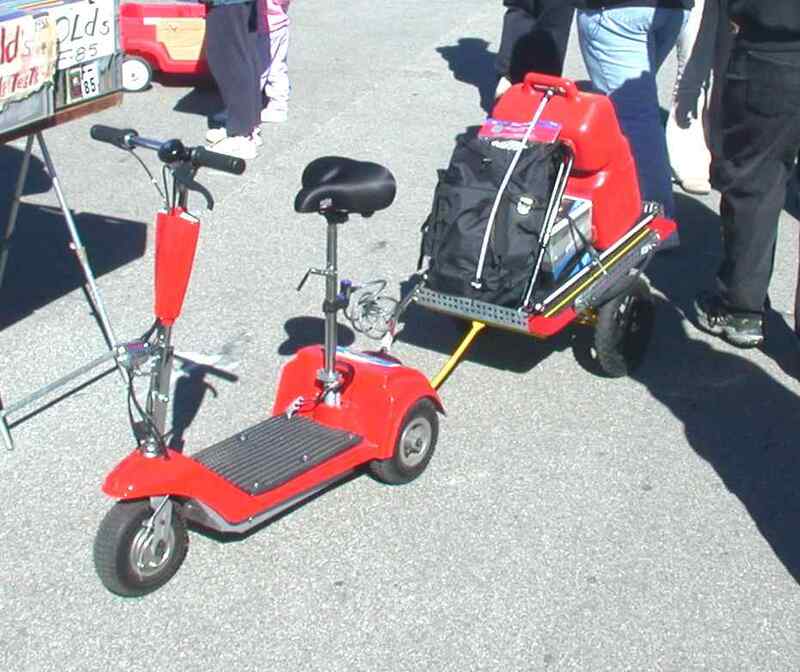 I saw this very nice scooter hauler at the 2001 Atlanta RV show. It attaches to the trailer hitch receiver on the vehicle and rides on the big caster wheel. It backs just like the base vehicle does. Unfortunately the company seems to be out of business. They displayed two URLs, www.careyallrack.com and www.hoghauler.com for the motorcycle version. There was also this phone number 770 652-3237 but I haven't tried it. I'm posting the photos here in case anyone knows of another brand of castered platform. And as an inspiration to those who might want to build their own.